Powered by EcoPractices®, we deliver innovative sustainability solutions that transform your success. In his role of sales and support for Sustainable Environmental Consultants Erosion Control Division, Zack manufactures Filtrexx® Siltsoxx™ products, sells finished compost, and assists with daily duties around the mill. He ensures quality control to guarantee that customers are getting the product they are expecting. He joined the SEC team in 2017. He believes Filtrexx® is a superior product and sees future growth in the market can launch additional opportunities and the introduction of more products for various erosion control needs to new customers. 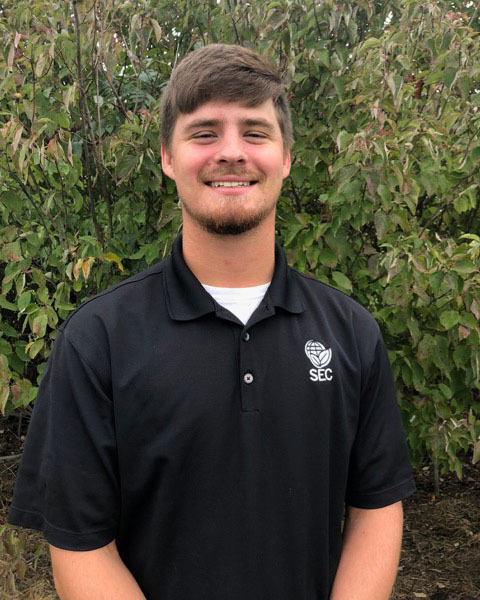 Before joining SEC, Zack worked for Shawnee County Public Works where his responsibilities included ensuring all the assigned areas were mowed and well maintained. In his spare time, Zack coaches his high school football team and enjoys the outdoors. Copyright © 2019 Sustainable Environmental Consultants. All rights reserved. Unauthorized reproduction prohibited. EcoPractices and Ecotag are Registered Trademarks of Sustainable Environmental Consultants. EcoProducer, Recognizing Responsibility, and Sustainable Best Management Practice are Trademarks of Sustainable Environmental Consultants. Ecotag Certification and its accompanying logo are Service Marks of Sustainable Environmental Consultants.